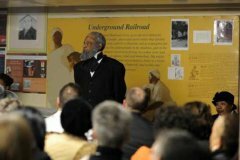 The religious sites and attractions along New York's Path Through History highlight the state's cultural diversity. The Cathedral Church of St John the Divine in New York City, which began construction in 1892, is the largest is the cathedral in the world. 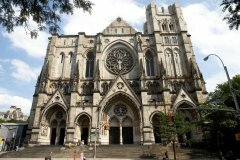 Also in New York City, near the intersection of Wall Street and Broadway, Trinity Church and Museum is an active parish church in the Episcopal Diocese of New York whose first building was constructed in 1698. 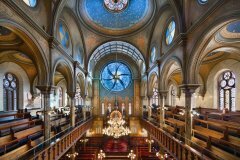 Opened in 1887, the Eldridge Street Synagogue and Museum in New York City is the first great house of worship built in America by Eastern European Jews. 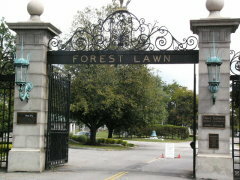 The National Historic Landmark combines Moorish, Gothic and Romanesque architecture. 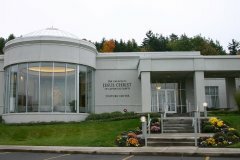 Hill Cumorah in Palmyra is the most notable of many hills, or drumlins, in New York State's Finger Lakes region and it figures prominently in events that led to the organization of The Church of Jesus Christ of Latter-day Saints. 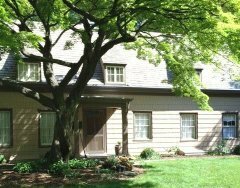 Built at the foot of the hill, the Visitors Center is an invaluable resource for those who want to know more about the many church historic sites in the surrounding area. 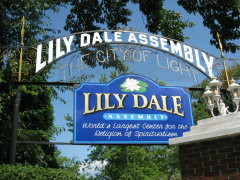 The Shrine of Our Lady of Martyrs in Fultonville was founded in 1885, and is the birthplace of Saint Kateri Tekakwitha, known as "the Lily of the Mohawks." It includes five chapels, two museums, a visitors center and 400 acres of flowered landscapes and tree-studded slopes and lawns. In the Hudson Valley, Union Church of Pocantico Hills, an unassuming country church in Sleepy Hollow, contains a stained glass window by Henri Matisse, his last work of art, and nine windows by Marc Chagall.